Like the bikes they celebrate, motorcycle collectibles have power. They connect you to the stars of the saddle, bringing you closer to heroes past and present who risk life and limb in leather. If you're passionate about bike memorabilia we believe buying it should be a pleasure, not a struggle. That's why we work hard to bring you the UK's best motorcycle memorabilia at the lowest prices. 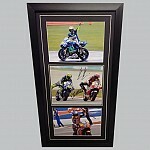 The superbikes collectibles we feature change constantly, so check back here often for signed photographs of stars such as Valentino Rossi, Jorge Lorenzo and Casey Stoner. We know superbikes collectibles only count if they're authentic. That signature on your photograph has to be genuine, otherwise it's just a stranger's scribble. At Sports Legends we're committed to authenticity and to ensuring all our motorcycle memorabilia is the real deal. When you've searched high and low for that special piece of autographed superbikes memorabilia, you'll want to protect it and you'll want to show it off. Ask us about our expert framing service and transform your motorcycle memorabilia into a brilliant piece you'll be proud to display. 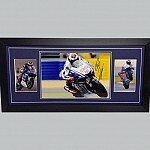 Superbikes memorabilia gets you closer to the sport you love. We'll get you closer still.